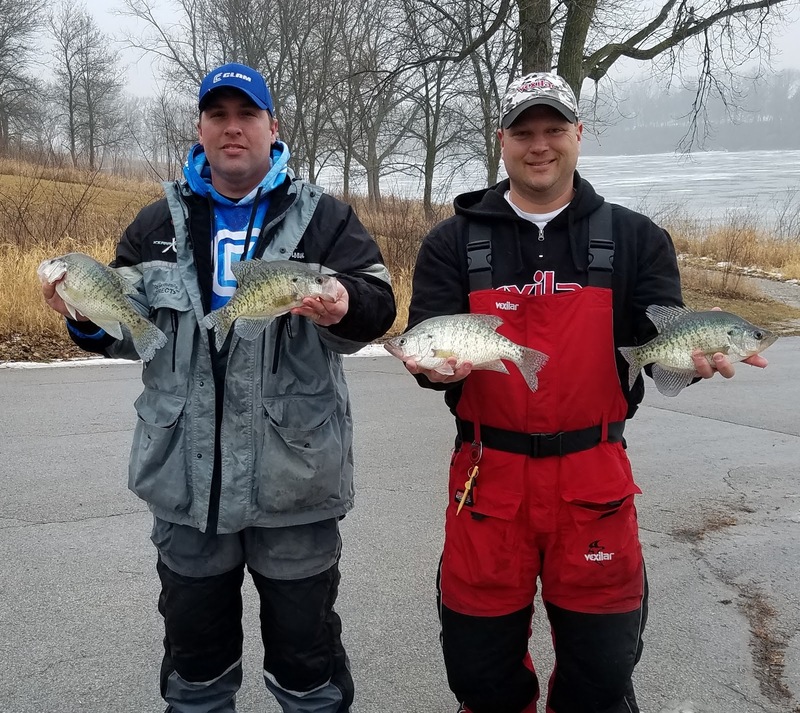 The Iowa State University Fishing Club held their annual ice tournament at Hickory Grove Lake today. It was a nice turnout of 17 teams for the event. Weather for the day was overcast/drizzle throughout the day. This actually helped the bite from the previous blue sky day on Saturday. Once again, Mark Anderson and I joined up to fish the event. The tournament limit was your top 10 panfish. The lake has a good population of bluegills, some crappies and some green sunfish mixed in too. We knew we had to focus on crappies to end up towards the top. We both hit the lake on Saturday to look things over. The previous weekend I was able to confirm some things we already knew about the lake from previous years. We took our past experiences and what we saw on Saturday to come up with a game plan. We had a solid plan A that we hoped would give us some crappies, and a plan B for big bluegills if we needed it. The forecast on tournament day was cloudy with intermittent rain all day long, temps were in high 30's and was very comfortable to fish. The overcast day definitely helped the fish bite all day long. Water clarity in the lake was over 6 feet, the clouds definitely played in our favor on this day extending the bite. We never did try plan B on the tournament day as plan A was very good to us. We fished water from 14 feet to 25 feet deep. Moving frequently helped us to stay on the moving schools of gills and crappies. Light colored jigs seems to be the trick for us with a waxworm, although there was an hour or so mid-morning that the fish preferred red spikes. Just more proof it is always good to have a variety of bait with you at all times. 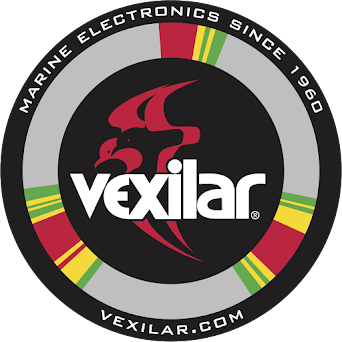 One big advantage we had today was using the Vexilar FLX-28. Almost all fish were caught suspended off the bottom several feet. Utilizing the zoom feature to fine tune jigging cadence and capitalizing on then minuscule target separation really made working the fish a fun and an easy task on the day. 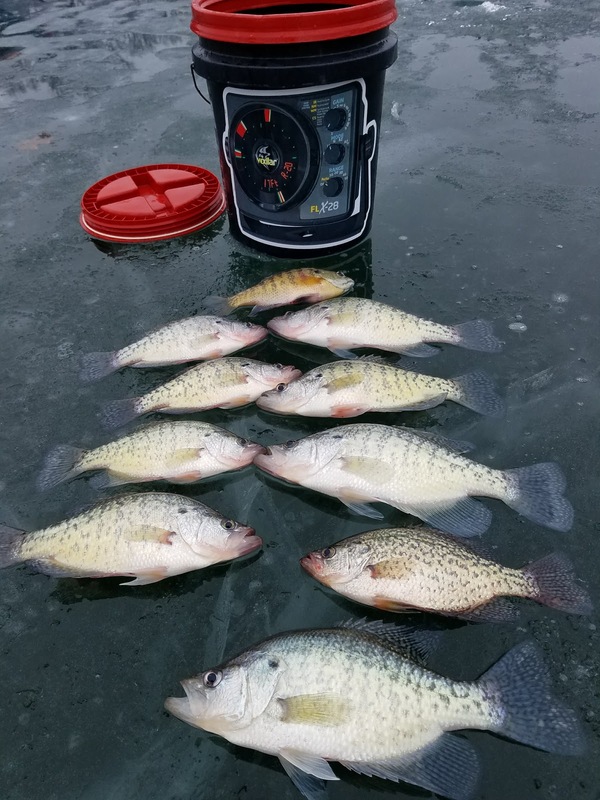 We ended up weighing in 9 crappies and one big bluegill that out-weighed other crappies that we had caught throughout the day. Our 10 fish weighed in at 7.84#, good enough for 2nd place. The winners, Chad Angell and Josh Sansgaard took 1st with 8.52#. This event proved once again that this lake has some great fish in it! Join me at the UNI-Dome this weekend for seminars including; Using Electronics on Ice, and Top Iowa Ice Fishing Destinations. See you at the DOME! 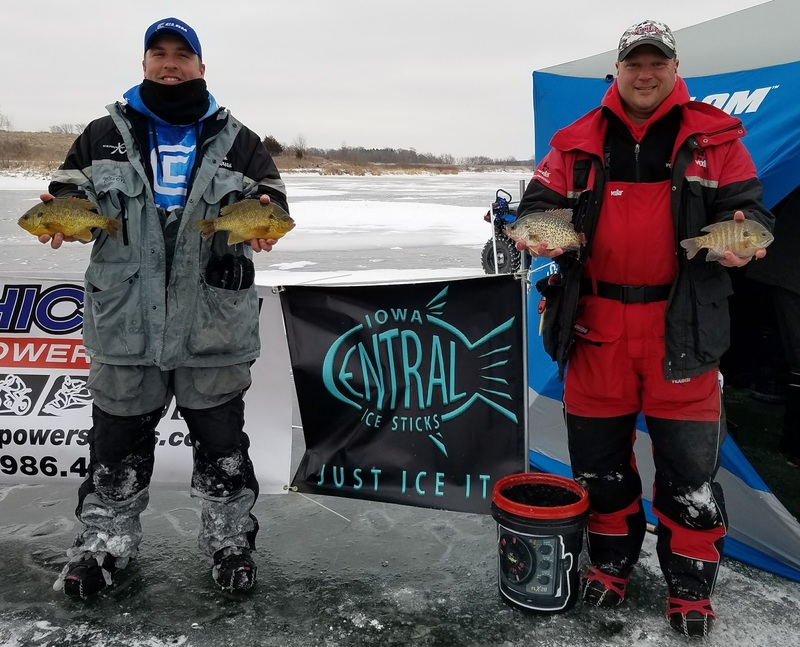 Central Iowa Ice Sticks, a Facebook group held an ice tournament at Badger Creek Lake south of Des Moines this past Sunday. The event brought teams in from all over the state to compete for the largest bag of fish. Each team had to catch 8 sunfish and 8 crappies to weigh-in for their team total. I teamed up with my usual tournament partner Mark Anderson for the event. 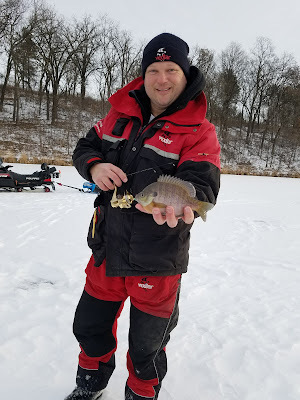 Mark was able to look over the lake to try and locate the bigger panfish. Badger Creek Lake is full of fish, but getting those larger fish to bite would get you in the top of the standings. We hit the lake bright and early on Saturday to find as many different areas that were holding the bigger fish. Mark found some better fish the week before and they were in the same general vicinity this past weekend. I hit areas that were not checked the weekend before, along with some deeper "crappie" hangouts. We had a plan A, B, and C for the tournament on Sunday, we were feeling pretty good about getting a good limit. No matter how much you plan, or how many areas you have, you just never know in an event of this size. 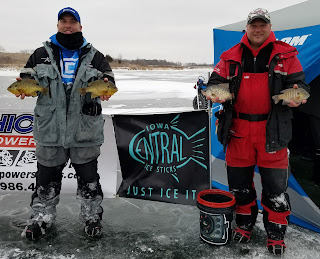 I have said it several times, but Mark and I work very well as teammates, even though we don't fish together very much during the ice season, when it is tourney time, we put it all together and make things work. We ended up staying with plan "A" all day long, which consisted of staying near the main channel of the middle-lake area. We worked over a large area, trolling through the area looking for active fish. Being mobile and using our Vexilar FLX-28 made finding and catching the fish fairly easy this weekend. This was one weekend that saw the fish taking a variety of baits, colors, plastics and livebait, it was more of a search and find on these particular days. Mark had the big fish bite for the day, bringing in a Red-ear sunfish that weighed 1.08 pounds, an amazing fish. We finished our bag of fish with 3 red-ears, 5 gills and 8 crappies. The crappies were right around the 0.70 pound range, the bluegills were all very nice as well. We ended up WINNING the tournament with a total of 10.85 pounds, almost 3/4 of a pound over 2nd place. It was just icing on top of the cake of a fantastic weekend of fishing! 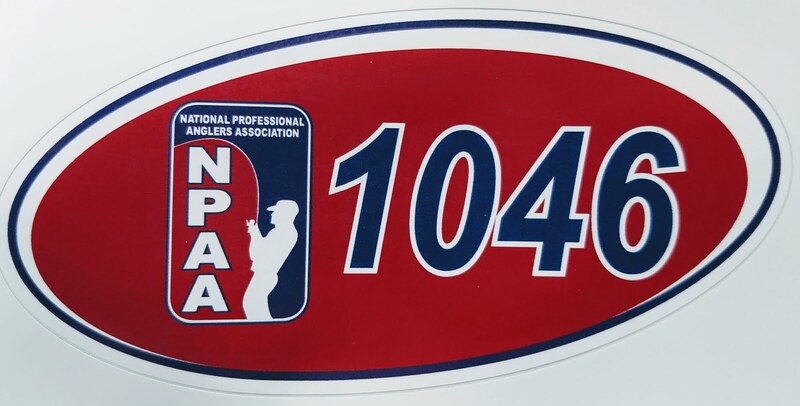 Hats off to Randy Bieghler for running his first ever tournament, I hope he continues his efforts in the future, as his first one was well ran. Badger Creek is a healthy lake right now, one to put on your ice fishing list. The past couple of weeks have been quite a roller coaster of weather patterns. Fronts seemed to move through every other day, mix in a couple snow showers and an abrupt rise in temperatures which saw over a 50 degree change in a 36-hour period. Yes, it is Iowa and winter is here. One nice thing all this weather did do was to grow a lot of ice. I am very thankful for that, and this past weekend I was able to hit 2 different NE Iowa lakes in search of some panfish. Aided in that was my trusty snowmachine, making traveling a breeze. David Gissel and I hit the road to the north to Lake Meyer in search of some gills and crappies. The first hour was great, several fish and some nice keepers of both species. Then, someone flipped the switch, nothing. Fish were reluctant to bite and really disappeared from the structure we were fishing. We fished many different spots, some with brush, some without and not much was shown for our efforts. Out of curiosity we chatted with a couple other anglers, same story, the bite was just off. Plan B, we could head home early, or hit another lake. We decided that two lakes couldn't be off, so we had to stop at Volga. We had a similar game plan and it worked much better here. The fish were very cooperative, as long as we were prepared for them. The bite was not a strong one, very light in fact. A spring bobber or a very sensitive rod tip was mandatory for catching fish. The fish were lighting up the Vexilar constantly around the brushpiles, but did not give us any hard bites at all. 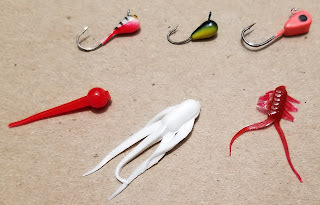 Very subtle bites, but keying into the bites and using our gear made for a great afternoon of catching gills and Crappies. Two lakes in one day, I have no idea how many holes we drilled, all I do know is I can't wait until I do it again! Be safe out there.